In 1936 a group of people involved in the film industry who were concerned about the growth of fascism in Europe established the Hollywood Anti-Nazi League (HANL). Members included Dorothy Parker, Alan Campbell, Walter Wanger, Dashiell Hammett, Cedric Belfrage, Donald Ogden Stewart, John Howard Lawson, Clifford Odets, Dudley Nichols, Frederic March, Lewis Milestone, Oscar Hammerstein II, Ernst Lubitsch, Mervyn LeRoy, Gloria Stuart, Sylvia Sidney, F. Scott Fitzgerald, Chico Marx, Benny Goodman, Fred MacMurray and Eddie Cantor. Another member, Philip Dunne, later admitted "I joined the Anti-Nazi League because I wanted to help fight the most vicious subversion of human dignity in modern history". The HANL came under attack from Martin Dies, the chairman of the Un-American Activities Committee as being a communist-Front organization. The actress, Luise Rainer, replied: "I do not believe in the so-called revelations made by the Dies Investigating Committee. I believe their purpose is purely destructive, aimed at discrediting worthwhile peace and anti-fascist organizations, which are so much needed in these worried times." The film director, John Ford commented in October, 1938: "May I express my whole-hearted desire to cooperate to the utmost of my ability with the Hollywood anti-Nazi League. If this be Communism, count me in." Another supporter of the Hollywood Anti-Nazi League, Frederic March, argued: "Every time during the last few years that I have felt impelled to protest an injustice, to cry out against man's inhumanity to man, or to espouse some social reform, I have been called a Communist. Because the founders of our country believed in justice, tolerance and the exercise of such social reform as would benefit the people at large, I insist upon the right to follow their example and still be recognized as a loyal American citizen." Walter Wanger tackled the subject directly in Blockade (1938), a film about the Spanish Civil War. 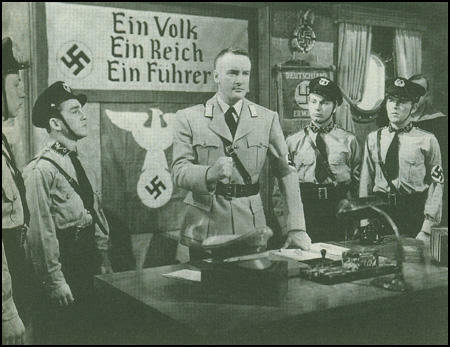 The film was written by two HANL members, John Howard Lawson and Clifford Odets and was immediately banned in fascist-run countries such as Germany, Spain and Italy. Catholics in the United States also objected to the film and Joseph Breen, a censor with the Motion Picture Producers and Distributors of America, accused the HANL of an attempt to "capture the screen of the United States for Communistic propaganda purposes." He claimed the League was "conducted and financed almost entirely by Jews." By 1938, 5,000 Hollywood filmmakers, writers, and technicians had joined the HANL. 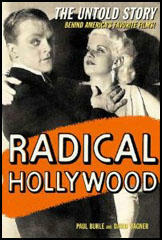 The launching of the Hollywood Anti-Nazi League (HANL) in 1936 marked a sea change. Bringing together liberal Jews from Southern California, relocated New York intellectuals, and recent and fresh exiles from Europe, it presented the most successful self-described "front" (a term, as screenwriter Philip Dunne remarked, with far less sinister undertones than later) of the Left and its allies since the Sacco-Vanzetti defense campaign of the middle 1920s. Exposing horrors in Germany and Italy, attacking American apologists for fascism and their Southern California links, the HANL quickly captured headlines. Leftist Dorothy Parker and liberal Oscar Hammerstein II publicly initiated the organization, with various commissions on culture, women, religion, and so on, dividing up the work. Almost overnight, HANL fund-raising played a key role in the Hollywood social whirl. Director Mervyn LeRoy, producer Walter Wanger, studio czar Jack Warner, likewise F. Scott Fitzgerald (who, by this time, insisted that he had become a firm Marxist), and Chico Marx (who certainly hadn't, unless "Marxist" meant something entirely different) listened to Judy Garland sing at a typical event that might have included other standard HANL performers such as Sophie Tucker, Dorothy Lamour, Ray Bolger, Benny Goodman, Fred MacMurray, Ben Blue, the Ritz Brothers, Bert Wheeler, and Martha Raye. Lesser-known (but quietly Communist) screenwriters Paul Trivers and Viola Brothers Shore led auxiliaries or wrote political playlets for small-scale antifascist theater productions. Writers and refugees joined forces in 1936 to found the Hollywood Anti-Nazi League, attracting a fair number of stars and creating a prototype for glamorous activism. Eddie Cantor, Paul Muni, Gloria Stuart, and Sylvia Sidney were among HANL's celebrity sponsors. "Almost overnight, HANL fundraising played a key role in the Hollywood social whirl," Paul Buhle and Dave Wagner write in their recent history, Radical Hollywood. HANL was attacked as a Communist front by the MPPDA's new industry watchdog Joseph Breen, the Legion of Decency, radio priest Father Coughlin, and Texas congressman Martin Dies, who chaired the House Un-American Activities Committee (HUAC). Might these leftists actually produce movies to advance their cause? In 1938 - even as Nazi filmmaker Leni Riefenstahl visited Hollywood - Warner Bros. announced an upcoming feature that might do just that. Confessions of a Nazi Spy involved a number of industry liberals, including star Edward G. Robinson. The Legion of Decency, which had defended Riefenstahl during her Hollywood visit, deemed Confessionsless anti-Nazi than pro-Communist. Charlie Chaplin, investigated for his radical sympathies as early as 1921, was similarly attacked for undertaking his independent satire The Great Dictator. 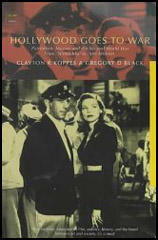 Presented only a few months after Pearl Harbor, the 1941 Oscars were awarded under lockdown. Academy president Bette Davis, a supporter of numerous Popular Front activities, proposed changing the traditional banquet into a public event, with ticket sales to benefit British war relief. The producers were not yet ready - and the actress resigned her post under pressure - but the next year's ceremony was replete with American flags and uniformed stars. Oscar Night '44, the first held at Grauman's Chinese Theatre, was dedicated to the fighting men of the United Nations (as the allied forces were then known). Warner Bros. dominated the evening with its Popular Front patriotic hits Casablanca, This Is the Army, and Watch on the Rhine.